New York Yankees Flashback: Aaron, and Gary, and Didi, Oh My! Home New York Yankees New York Yankees Flashback: Aaron, and Gary, and Didi, Oh My! I used the word “stirring” to describe the New York Yankees victory in Game Three of the 2017 ALCS over Houston , but it really rightfully applies to the come-from-behind gem they pulled out of a hat on October 17 in Game Four. Fans may be surprised to read that Sonny Gray matched zeroes with Lance McCullers, Jr. through five, but a leadoff walk and catcher’s interference in the sixth were the first two of three runs to score on a Yuri Gurriel double off David Robertson. Carlos Beltran doubled off Chad Green in the seventh to make it 4-0, but that’s when the fun began. An Aaron Judge home run started a two-run rally in the bottom half, then his double and one off the bat of Gary Sanchez propelled the four-run rally in the eighth that brought home the 6-4 victory. 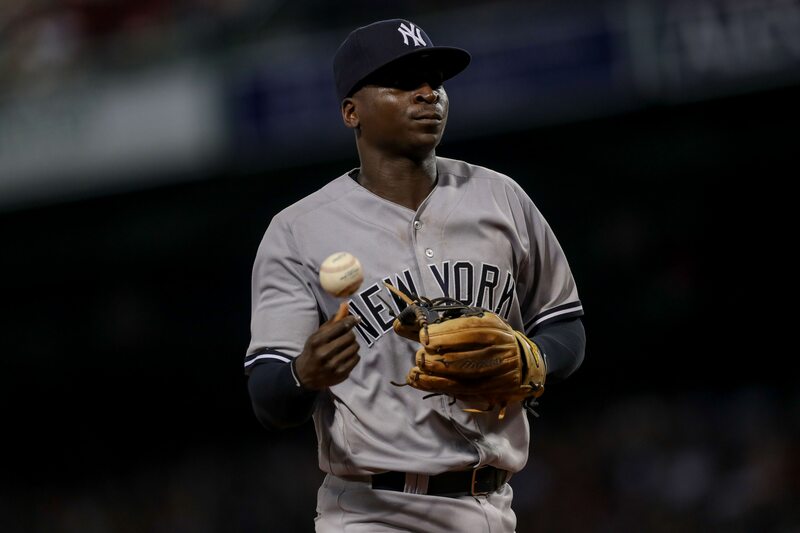 Didi Gregorius tripled and singled in the two rallies as well. Brian Doyle collected another three hits as did Series MVP Bucky Dent, and the Yanks won the 1978 Classic on October 17 by taking their fourth straight game over the Dodgers, this one by a 7-2 score. It looked like anything but a sweep, as the Yanks were down in the seventh inning of Game One at the Stadium vs. the San Diego Padres on October 17, 1998. But Chuck Knoblauch hit a three-run homer near the left-field foul pole to tie it, and Tino Martinez, after taking a close pitch from Mark Langston to go to 3-2, blasted a grand slam. The Yanks won the game, 9-6 behind David Wells. Yankee fans were happier with the work of the loser Kevin Brown that day than in most of the days he would wear the Pinstripes six years later. Broadcaster Michael Kay invited Yankee fans to “take a ride on the subway” on October 17, 2000, as David Justice‘s three-run bomb to the upper deck in right was the crippling blow in a 9-7 ALCS-clinching win over the Seattle Mariners. It set up a Yankees vs. Mets confrontation in a Subway Series. Lots of team managing news for the Yanks on October 17, and the 1964 moves were far from commonplace. The Yankees fired Manager Yogi Berra after the seven-game World Series loss to the Cardinals. Further, St. Louis skipper Johnny Keane resigned his position, and then he was hired by the Yankees. Also, on October 17, 1929, the Yankees named former hurler Bob Shawkey to manage the 1930 club following the sudden death of Miller Huggins just weeks before. In further October 17 Yankee Manager transactions, Lou Piniella was named to pilot the team on this day in 1985, and in 1988, Dallas Green replaced Lou on the very same day.